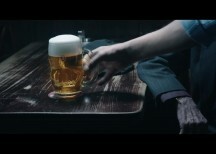 This TVC was created to help with the ongoing crisis of Czechs not drinking their beloved beers at local pubs. Budweiser Budvar has being saying NO to compromises in its quality for 120 years. So if anyone can say to all drinkers “support your local innkeeper who doesn’t lower the quality for short term gain” it’s them. In this film we appreciate pub owners who refuse temptations even in these complicated times. We also invite people back to the pubs to pay their respect by having beer there.